Every ending doesn't have to be happy. Real life is like that. But it is nice if there is a ray of hope somewhere in the future. It's better not to dwell in Downerland all the time. If your whole world is negativity then you're eventually going to kill whatever audience you have if you ever managed to acquire any audience in the first place. Negativity and depression is tedious and tiring for both you and those who are around you. Happiness instills an inner peace and an outward energy which in turn encourages hopefulness. A positive outlook needs to start with you before you can pass it on to others. Say for example you are going for a job interview or trying to make a good impression on someone with whom you'd like a relationship, you'd most likely start with a smile and a pleasant demeanor would you not? This is the basis of good marketing. And it goes beyond first impressions. You don't always have to be bubbly or sugar-coated, but a positive nature will draw people to you. Most marketing focuses on the happy side. The marketer typically sets out to show how what they're offering can bring happiness. Generally speaking, people are looking for something that will inspire happiness within them and fill them with hope for a better tomorrow. Even if only a temporary fix is being offered, the goal of good marketing is to suggest that the answer to finding hope and happiness is at hand. Since my most recent Battle of the Bands coincided with opening day of the Blogging from A to Z April Challenge, it's not too surprising that I had a record number of votes for this contest. However I was a bit surprised by the outcome. I fully expected a rout by the venerable Fab Four. It did not happen. As I had expected the Beatles version of "Act Naturally" was the over all more preferred with 45 total votes including my own. I've been a long time fan of the Beatles and Ringo was the first one I ever heard perform the song "Act Naturally". I prefer the skiffle band country sound that their version has--the instruments sound better to me and I enjoy the vocals more. Buck is good, but the Beatles are my preferred taste in music. Now Buck Owens did not get totally trounced in the contest. His version ended up with a very respectable 38 votes--far more than I had anticipated. Owens always came across as a pretty likeable guy to me so I'm glad to see him get the respect that he received from the voters. Final tally for "Act Naturally": Beatles 45 votes to Buck Owens 38 votes. 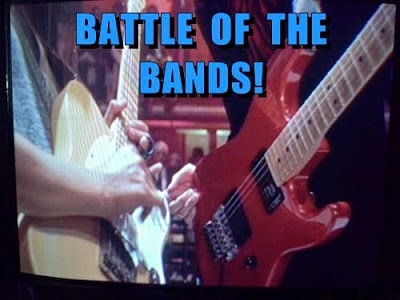 Next Battle of the Bands comes on Tuesday April 15th. Hope you'll visit and vote again. I'll be once again tying the song I use into my A to Z theme of Promotion and Marketing. Do you have a positive feel about yourself or whatever it is you are marketing? Do you feel that you could be contributing to another's sense of well-being and happiness with your product or yourself? Can you think of some examples where the negative approach works best? Being happy wins hands down everytime. Always look on the bright side of life.........though sometimes it's hard. Thanks Arlee for this .. too many are too negative about so much without seeing hope and happiness as part of the spectrum. Not surprised the Beatles won. Very good advice, Arlee. Happiness is also catching, a little rubs off on the people around you. Of course the Beatles would be the winners. I recently read a self-published novel with an extremely negative ending. At first, I was horrified. The author had created a sympathetic character who had lost nearly everything of importance in his life. How could she do this? Then, once I calmed down, I realized my dismay was actually a compliment. I had come to care enough about the character to want a happier ending for him. But in terms of marketing? Yes, we need that promise of happiness. Raj-- A job interview is one of those situations where negativity can be such a big turn-off that you probably won't even make the list unless you've got something else big going for you. Yvonne -- There's a lot of life's garbage that can sully our thinking, but it's best to take out the trash before the waste can starts overflowing. Susan -- Life is bad enough at times without carrying one's burdens around all the time. Alex --- And there are different types of bad attitudes--anger, depression, defeatism, etc. Attitudes can rub off on us--good or bad. I was surprised how close the vote was. Carolyn -- Yes, as I was just saying in the previous response. And especially if one has a tendency toward the negative it's best to hang around positive types to lift them up. Hopefully the negative will not be more overpowering than the positive side. Tamara -- A negative story ending can be a very valid way to go if that's the message we want to convey but you want not be well served to market the book by saying something like "you'll feel so bad after reading this" or "this book might drive you to suicide". That kind of message will not attract many takers. There always needs to be some balance. Wow. That was a record number of votes for BOTB. I completely agree about a positive attitude. When I am feeling negative, I tend to attract more negative crap. It requires a conscious choice to turn that around. Sometimes watching or reading funny things helps. Negativity does drive people away. We all have bad days, but when that's all you hear from someone, it tires you out and you want to escape and never look back. I'm going to be positive, and say something good about both versions of Act Naturally. I prefer Ringo's voice to Buck's (Don't Pass Me By is my favourite Ringo song), but overall I prefer the early rock/country sound that Buck and his Buckaroos do. Funny that, I didn't vote for the Beatles even though they are/were countrymen of mine. A positive attitude is always a great thing to have, I wish it was possible to maintain it all the time. Good advice for interviews in particular Lee. My daughter was on an interview that she doesn't feel went very well. She has another one later today. I'm going to steer her to your blog post. She should read it before she takes another step out the door. I try to stay upbeat and positive about promotion and marketing. Good for Buck for giving them a run for the gold. I think I voted for him. Yet another thought provoking one! "You don't always have to be bubbly or sugar-coated, but a positive nature will draw people to you." Yes. Let us be positive in all our dealings! Great tip for the day! What you put out into the universe is what it sends back. Buy The House on the Corner! Guaranteed to make you happy! Buy Shadow Spinner! The drug-free cure for depression! Robin -- Humor can be a good antidote. Once a sour face starts cracking with a smile ones downcast state can get a lift. Shesha -- Catching in a good way unlike negativity which can be like a nasty case of the flu. Patricia -- If you're normally a positive person people will take you more seriously when you're down and not see it as business as usual. Kevyn -- I'll go along with that. There's something good to be said for both versions. Jo -- If you're trying to make a good impression to begin any future relationship starting off negative is not a good plan. Deb -- Hope it helps. An employer is looking for someone that will be around them, other employees, and perhaps clients and you don't want to get somebody that will drag everyone else down. Susan GK -- I know it's easy to become discourage with PR work especially if you don't like it in the first place, but marketing is all about the positive spin. PV -- We can be models to which others aspire to be. Not many people want to be unhappy. C.Lee -- So true. It's all about karma. Andrew -- Stay with truth in advertising. If other people are saying that I suppose you could quote them. Truth in advertising is a thing? Cause, well, I haven't seen that. Can't stand being around a negative attitude or person. I don't need any darkness. It started so well and then you mentioned Jobs . . . . DONT MAKE ME GO TO WORK AGAIN. . . . . . Stopping by on the 9th day of the #atozchallenge after reading hundreds of blogs this past week. Delighted to find yours, uncluttered, focused, readable.Would have expected nothing less. I was an apprentice last year but doing it right in 2014 thanks to all the posts you've sent out about participating. I've taken notes as I blog hop and am now thinking about WHY i write the initials, NI, for of no interest. All the bloggers hard work down the drain with no place to leave a comment, a cluttered presentation with no place for the eye to rest. Black backgrounds with colored fonts unreadable. I followed instructions. Posts complete in a queue, leaving time to visit. Stats improving everyday. I LOVE the new blogs I'm following, carefully selected. It was a learning curve last year I am proud to say I am benefiting from this year.Congratulations and thank you to all the team. Andrew -- Truth in advertising is something I'd like to believe in, but often the advertising do fudge a bit. I'm thinking of restaurant ads where they make the food and presentation look so good and then you go get it and it looks nothing like they had pictured and tastes like crap. I guess you can't blatantly make a claim that's not true but can suggest things that in the end are deceptive. I guess that's putting a positive spin on the advertising message. Susan Kane -- I can conjure up my own darkness without having to stand beneath the dark cloud that belongs to someone else. Rob -- Oh I wasn't talking to you and me, I was talking to those younger folks who still have to work for a living. Stepheny -- Thank you for this great comment. We try our best to give bloggers good advice that will help them build an audience, but there are some who are adamant about the way they do things. We can only do so much and they have to deal with what they reap from their efforts or lack of. I think I have a positive outlook - I do struggle with depression and think it's more than just a tedious tiring thing. My doctor thinks so too! I do understand what you're intimating, however, I do think that to lump depression in with a fleeting feeling that can be turned on or off at a whim is a generalization. I'm singing that happy tune in my head, always look on the bright side of life... thanks blogman. Happiness is a choice - it's what I shared on my Effectively Human blog today. There are times when things aren't all cake and ice cream, and those need to be addressed readily and reasonably, especially if they are affecting others in a negative way. Everything we do (or don't do) has an impact on people and the world around us. To be conscious of our decisions, making positive choices that will improve our environment and community, is vitally important to making ourselves happier in the long run. Of course, there are times when we have so little control over things, like the other driver that ran the red light, or the Debbie Downer neighbor or family member, who has to vent to us all the time. But for the most part, those can be handled responsibly enough. It's the nature of being human, and you're right. It's certainly never a good idea to go for an interview with a bad attitude or glum look on your face. It pretty much says, "I don't really want this job. I'm just here to waste your time." Glad to see Buck had a decent number of votes in your BOTB. I do think, had it just been your 'regulars' he might have won. 'Accentuate the Positive' a Goid place to be. Unfortunately in marketing the positive is often over-accentuated in order to give a distorted view of the product. In life in general not so much! Never hurts to have a positive attitude for certain situations. Even this glass-half-empty-girl knows when to smile and be happy. Hope is a great word. And it is good to have hope. I have hope. But I am not all about being a happy person all the time. I am real! This is me! Christina -- I don't mean to trivialize what can be a very serious issue, but truth is truth. I think all things can be overcome with a proper mental outlook. Not saying it's necessarily easy though. Spaceguy--And thank you, Brian--er, I mean Spaceguy. MJ-- Like love or any other emotion, happiness is a choice. If we are taking control of our lives, our emotions, then we are letting some other force do it and that doesn't have to be. Life Is Beautiful was a great film that illustrated this principle. Faraway -- Marketing has to overaccentuate the positive and our lives should do the same. Negative energy does just what the name implies. Donna -- Mostly it's all about perspective. Paula -- Without hope there is not much future. I see at least two different kinds of happiness: That which is an ongoing state that is at the core of our being and the superficial state of how we feel in times that call for happiness. There are also other forms of happiness I could identify but those are the primary ones. I may not feel happy, but I am always basically happy which means I can turn my external happiness back on whenever I'm ready to. My first boss used to say, "If you don't believe in yourself, you can't sell yourself. If you don't believe in your product, you can't sell your product." I guess this is the same as the happiness or positive nature you've touched on. Having voted for them, it's good to know the Beatles won! It's funny - In my current project - sharing stories for parents/caregivers of adults who have Down syndrome, the majority of them ARE happy - even though people outside of our community would think otherwise. What's important - I have found, is to have a place where people can share the "not so happy" ones too - without judgement. Proactive -- If you don't believe in self and product then you'd better be a very good actor if you want success. Wang -- I totally agree with your dad's outlook. Unhappiness is also a choice. Agnes -- I try to always find an upside to situations. Mom-- I think we can project unhappiness onto people if they're willing to accept it. Others manage to look beyond what others think.